Why hasn't this been tried before? Or has it? On December 10, the Orange County Register reported that "longtime county inmate" Malcolm King had successfully argued he was entitled to special meals because eating the salami served at his facility would violate his religious beliefs. Specifically, he claimed to be a believer in Festivus. Festivus, of course, is the holiday popularized on Seinfeld that provides "another way" for people to celebrate the holiday season without all the commercialism. Wikipedia says Festivus was based on a family tradition of one of the Seinfeld writers, but now has become part of popular culture. 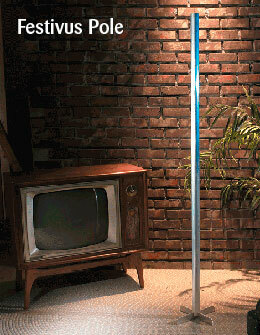 Instead of a traditional Christmas tree, celebrants put up an unadorned aluminum "Festivus pole." King's attorney said his client had originally told the department his religion was "Healthism," which he conceded was just made up. "He's healthy, so he said 'health' and added an 'ism," the attorney said. The Sheriff's Department refused to comply, saying kosher meals are more expensive and, of course, that there's no such thing as "Healthism." Still, the judge agreed at King's sentencing to issue the order, which makes me think this was part of a plea bargain. The judge allegedly "pulled King's lawyer and the prosecutor aside and said he needed a religion to put down on the order to make it stick," the report said. "I said 'Festivus,'" King's attorney claimed, and Festivus it became. The county then sent someone off to research Festivus itself, but was ultimately unable to persuade Johnson to change his mind. King therefore enjoyed non-salami meals for at least two months. According to the report, King's attorney "acknowledged to the county and a judge and to the [Register] that it was a farce," but precedent has now been set. In the future, let there be a Festivus for the rest of us, not just for convicted drug dealers.